This beautiful American Flag most likely dates to the period between, or inclusive of, the Mexican War (1845-1848) to the Civil War (1861). The flag is constructed of wool bunting and hand-sewn cotton stars. The beautiful mellow color of the white stripes, bold maroon-red color of the red stripes, and dark blue denim color of the blue canton combine, along with the exceptionally rare oval pattern and three central stars, to form one of the rarest and most visually striking early American Flags. There are hundreds of small, expertly done darned holes in the wool of the red and white stripes, demonstrating the loving care taken by previous owners of this flag. The sleeve is correct for the period and another indication that in all likelihood the flag is pre-Civil War. In fact, nothing in the construction of this flag, as far as I am aware of, would preclude it from being even older, to include possibly being an exceedingly rare 18th century flag. A length of the topmost red stripe appears to have been taken as a souvenir, as was sometimes done to early flags to give as a memento of heroism or the loss of a military officer, indicating a possible military usage or association with this particular flag. 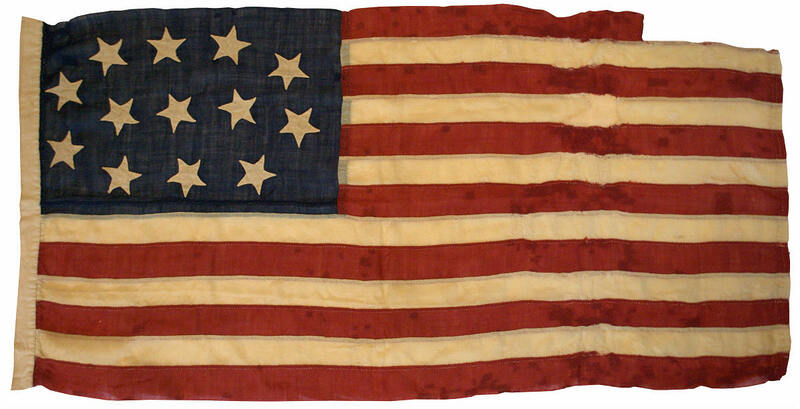 Overall, this is without a doubt one of the finest and rarest American flags in the collection.